Sewer problems can be overwhelming for homeowners and small businesses in Bergen County and Morris County, Hudson county. Whether you’re running a business, or trying to maintain a home while juggling work, family, and other priorities, the last thing anyone wants to deal with is a broken sewer line or sewage backing up into your basement and bathroom drains. When you need sewer repair service, you need fast response times, minimal hassle, and fair pricing. That’s where we come in. At A1 Sewer & Drain Services, we make sewer repairs simple. With same-day service and response times of under an hour, we’ll show up almost immediately to fix the problem quickly and effectively. Life is already complicated enough: don’t let drain and sewer problems add more stress. 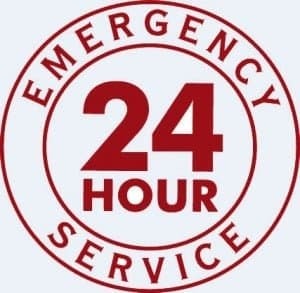 We’re available 24/7 for emergency sewer repair, drain repair, and more, so you’ll never have to wait for repairs while the problem gets worse. Our team of experienced NJ sewer plumbers provide a full selection of sewer and drain cleaning and repair services. 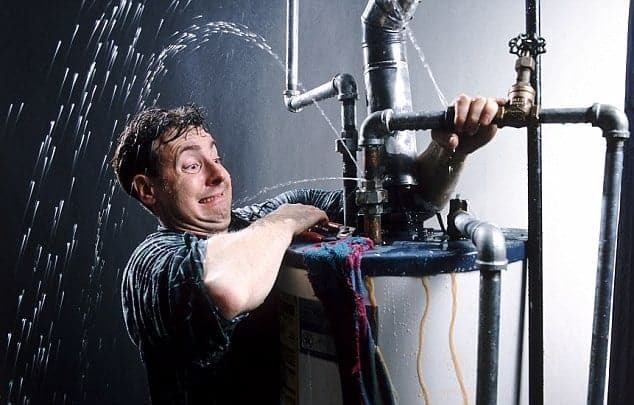 No matter what problems you’re having with your wastewater plumbing, our contractors can fix the problem for you. For great service from experienced NJ sewer plumbers, call us any time at A1 Sewer & Drain Services. You never know when sewer problems will strike unexpectedly. Sewer systems in Bergen County and Morris County are prone to a variety of problems that can stop wastewater from flowing correctly into the municipal sewers, and most of these problems build up slowly over time. Whether gradual corrosion is eating away at the walls of the pipe, or tree roots are making their way inside and blocking the pipe, NJ homeowners are rarely aware of problems with the sewer line until the problem gets serious. A broken, burst, collapsed, or severely clogged sewer line can seem to happen out of nowhere. Suddenly, toilets won’t flush, drains bubble and gurgle, and foul-smelling wastewater oozes up through sink and basement drains. Sewer pipes can fail on weekends, holidays, or in the middle of the night. As inanimate objects, they have no regard for civilized hours. When you’re having serious sewer pipe problems, you simply can’t afford to wait until normal office hours for repairs. Once a clogged or damaged sewer line is noticeable, the problem will quickly get worse and worse, potentially causing sewer backflow, flooding, and costly water damage. The best way to prevent water damage from biohazardous wastewater is to get sewer repairs as soon as possible, no matter what time it is. At A1 Sewer & Drain Services, we have experienced NJ sewer plumbing contractors on call 24/7 for emergency drain and sewer repairs. Even in the middle of the night, you can always call us for quick repairs in less than an hour. When you get sewer repairs fast, no matter what day or hour, you’ll avoid costly flooding and water damage. Call us any time at A1 Sewer & Drain Services for fast, reliable, effective sewer repairs today. Call Us Today for Fast, Effective Sewer Repairs in NJ, at 201-645-0888. For many Bergen County and Morris County homeowners, just thinking about sewer repairs can be a major headache. Who wants heavy machinery digging up their yard, and ruining the lawn you’ve spent years perfecting? Fortunately for people who take pride in their lawn and garden, sewer excavation for minor repairs is a thing of the past. Although our NJ sewer plumbers may still need to excavate in some cases, we can often avoid this disruptive process completely with trenchless sewer repair techniques. Trenchless sewer repairs don’t require any major digging, allowing us to fix serious sewer problems with minimal disruption. Because trenchless technologies simplify the sewer repair process for everyone involved, we recommend them whenever possible to save you time and money. Trenchless sewer repair techniques can be used to fix all kinds of sewer pipe problems, from minor cracks and pinhole leaks to sewer pipe collapse. At A1 Sewer & Drain Services, we use trenchless techniques whenever possible to keep sewer repairs simple and non-disruptive for NJ homeowners. There are actually a couple of different types of trenchless sewer repair techniques that we can use to fix sewer pipe damage without digging up your yard. Different techniques work in different situations, but we can almost always find a way to repair your sewer line without excavation. Over the last few decades, trenchless service solutions technologies for main sewer pipe line have revolutionized the sewer repair industry, making the process simpler than ever for both contractors and property owners. Sewer relining. Pipe lining is a quick, simple, cost-effective solution for cracks, holes, and underground water leaks in your sewer main line. For sewer relining, we don’t need to excavate the sewer line: we only need a small upstream entry point. A flexible liner, made from resin-coated fiberglass cloth, is pulled or inverted downstream into the damaged part of the sewer pipe. Then, once it’s in place, we use steam, heat, or UV light to cure and harden it. Once in place, the new sleeve lines the interior of the sewer line, keeping water inside and keeping out tree roots, sediment, and other materials that could get in through cracks and holes. Pipe lining has quickly become a preferred solution for fixing sewer pipes and drain lines, since it’s minimally invasive and highly effective. The liners themselves are durable and corrosion-resistant, lasting for years without any further problems. Pipe bursting. 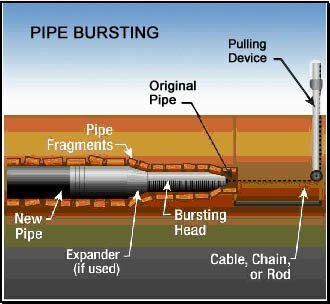 Pipe bursting is a trenchless sewer replacement technique, allowing us to replace sections of sewer pipe without excavation. Pipe bursting uses five key pieces of equipment: an expander head, pulling rods, a pulling machine, a retaining device, and a hydraulic power pack. The hydraulic bursting head breaks apart an already severely broken or collapsed sewer pipe, pushing the fragments safely outward and away. Then, a brand new section of pipe is pulled into place, into the same opening where the previous pipe was located. This process requires only minimal digging, as opposed to full scale sewer excavation, and can be used to replace up to 400 feet of sewer or drain pipe. For sewer pipe replacement pipe bursting is often the simplest, least intrusive method for NJ homeowners and businesses. 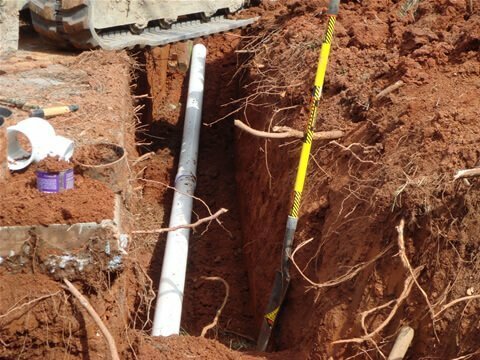 Although there are still some circumstances in which we’ll need to excavate, we can usually use trenchless sewer repair techniques to fix sewer problems without making a mess of your yard or property. To find out more about trenchless sewer repairs in NJ, call us any time at A1 Sewer & Drain Services. Did you know that tree root incursion is a leading cause of sewer problems in Bergen County, Morris County, and elsewhere in NJ? Even if you don’t have any trees on your own property, the root system of a tall tree can extend for hundreds of feet, meaning your neighbor’s trees could get into your sewer line. Tree roots are attracted to the moisture and nutrients inside a sewer pipe, and if there are any small holes or cracks, new root shoots can get inside and continue to grow. Over time, tangled clumps of tree roots can obstruct water flow through the sewer pipe, causing wastewater to back up into your plumbing and drains. As the roots grow and expand, they can also cause serious damage to the pipes, causing bellying or sewer pipe collapse. Know where your sewer line is located. If you’re landscaping your yard, you’ll want to avoid planting trees or large shrubs too close to the sewer pipe. Install chemical or physical barriers underground. Physical and chemical barriers are available that stop roots from growing past a certain point, keeping them away from your sewer pipe. Landscape with sewer-friendly plants. Small shrubs and flowering plants have soft, short roots that won’t break apart your sewer line. Remove roots near the main sewer line. You can remove parts of a tree’s root system that are too close to the sewer pipe, without harming or killing the tree itself. If you do have tree roots in your sewer line, you’ll probably need a combination of sewer repairs and sewer cleaning. Sewer cleaning with hydro jetting breaks apart the roots inside the pipe, washing them downstream. Then, sewer repair techniques like pipe relining can patch up holes and cracks, so you won’t have to worry about more roots growing inside. Need Sewer Replacement in Bergen County or Morris County NJ ? Sometimes, your sewer pipe may need to be replaced, rather than simply patched up and repaired. When you need sewer replacement, call us any time at A1 Sewer & Drain Services. Using either sewer excavation or trenchless pipe bursting, we can remove old pipes and install a new one. Although cracks and holes in a sewer line can often be repaired, serious damage to a pipe’s structural integrity will require total sewer pipe replacement. A pipe that has burst or collapsed can’t necessarily be put back together, so you’ll need a new section of sewer pipe to replace it. Sewer replacement in NJ doesn’t have to be a major hassle. At A1 Sewer & Drain Services, we’re available 24/7 for all your residential an commercial sewer service needs. We can quickly replace a sewer main line with trenchless pipe bursting, and when we don’t need to excavate, you’ll hardly be able to tell that you’ve had sewer replacement at all. Call us any time to find out more about NJ sewer replacement from our local sewer plumbers at A1 Sewer & Drain Services. Broken sewer pipes aren’t the only cause of sewer problems in NJ. Clogged pipes can also cause sewer backup. Sewer pipes can be clogged by many different things, including tree roots or sediment in pipes with cracks or holes. The things you wash down the drain or flush down the toilet can also clog your sewer line. Some of the most common materials we find inside of sewer pipes include feminine products and “flushable” wipes, neither of which break down quickly enough not to clog up the pipes. If it’s not toilet paper, don’t flush it. To clean sewer lines in Bergen County and Morris County, our local plumbing contractors use hydro jetting. Hydro jetting is a highly effective method for sewer cleaning, using streams of water at pressures up to 400 PSI to break apart and wash away debris that’s build up inside the sewer pipes. From paper products to tough tree roots, hydro jetting can break through even the toughest debris, restoring clear water flow and preventing flooding and water damage. This quick, simple process can take as little as 30 minutes to complete. After hydro jetting, we can use sewer camera inspection to check for pipe damage to see if you’ll need any sewer repairs. To find out more about sewer cleaning with hydro jetting in NJ, give us a call any time at A1 Sewer & Drain Services. You can prevent costly water damage to your home with sump pump installation or sewer backflow valve installation. Basement sump pumps prevent flooding through the basement floor drains during severe weather, a burst water main, or other emergencies. Sewer backflow valves also help prevent backflow, and may be mandated by local building codes in low-lying areas. To learn more about pumps in NJ, call us any time at A1 Sewer & Drain Services. At A1 Sewer & Drain Services, we keep drain and sewer repairs simple for Bergen County and Morris County homeowners and businesses. Don’t waste time worrying about your sewer line: we can fix most problems in less than a day of work, and with trenchless sewer repair technologies, we rarely have to dig to fix sewer pipe damage. To find out more, or to get sewer repair service today from an experienced NJ sewer plumber, call us any time at A1 Sewer & Drain Services, at 201-645-0888.